As you may have noticed, updates on this blog are few and far between. 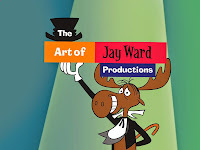 As new information or artwork comes in, I will post on this blog but in the meantime, check out my sister blog, artofjayward.blogspot.com where I continue to post new info and art on the Jay Ward studio. Lately, I've been posting regularly on Bill Scott's gag cartoons on life at Ward's and will continue to do so for the next few weeks. 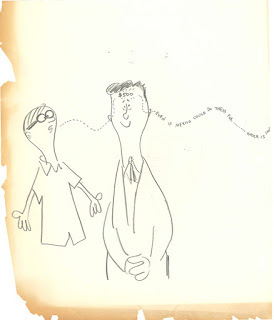 Bill Scott, Jay's partner and head writer, producer and all around voice artist (Bullwinkle, Dudley Do-right, Super Chicken, George of the Jungle, etc) came up through the animation ranks and, as a cartoonist armed with biting wit, made humorous observations on their difficulties with ad agencies, networks, their status in the industry, and even each other.